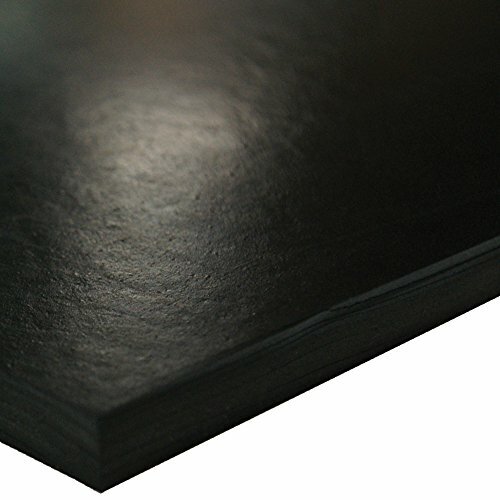 The black SBR rubber sheet is 70 Shore A and has a smooth finish. SBR (styrene butadiene rubber) is a synthetic rubber that provides good abrasion resistance. A hardness measurement of 70 Shore A means the material has a hard surface for good penetration and wear resistance. Rubber is a strong, flexible material that provides good insulation and shock absorption. Some types of rubber may be weather or chemical resistant and withstand high temperatures. Wear resistance is the degree to which the rubber resists abrasion. Hardness is measured with scales Shore D, Shore OO, and Shore A, which is the most common scale. A higher number means the material is harder and more resistant to penetration. A lower number means the material is softer and more flexible. Tensile strength, used to indicate the material’s overall strength, is the peak stress it can withstand before it breaks.